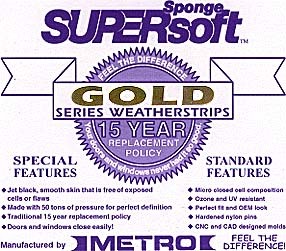 Metro’s SUPERsoft Sponge Gold Series Weatherstrip product is fully warranted for 15 years from the date of purchase. Platinum Series Weatherstrips have a 30 year replacement policy! You understand that your automob ile restoration will not be complete without new weatherstripping, but not all replacement products have the quality and durability SUPERsoft Sponge will deliver. All replacement weatherstripping products Metro Moulded Rubber Parts makes are created with Micro Closed Cell Sponge which is superior to our competitors products and to original equipment weatherstripping! Not all weatherstripping products were created from the same rubber products, which is why Metro utilize s over 40 different compounds to “duplicate” the original part’s features and qualities.